WASHINGTON - The Obama administration on Friday ended a high-tech border fence project that cost taxpayers nearly $1 billion but did little to improve security. Congress ordered the high-tech fence along the border with Mexico in 2006 amid a clamor over the porous border, but it yielded only 53 miles of protection. Homeland Security Secretary Janet Napolitano said the lesson of the multimillion-dollar program is there is no "one-size-fits-all" solution for border security. Napolitano said the department's new technology strategy for securing the border is to use existing, proven technology tailored to the distinct terrain and population density of each region of the nearly 2,000-mile U.S-Mexico border. That would provide faster technology deployment, better coverage and more bang for the buck, she said. Although it has been well known that the virtual fence project would be dumped, Napolitano officially informed key members of Congress Friday that an "independent, quantitative, science-based review made clear" the fence, known as SBInet, "cannot meet its original objective of providing a single, integrated border security technology solution." The fence, initiated in 2005, was to be a network of cameras, ground sensors and radars that would be used to spot incursions or problems and decide where to deploy Border Patrol agents. It was supposed to be keeping watch over most of this nation's southern border with Mexico by this year. Instead, taxpayers ended up with about 53 miles of operational "virtual fence" in Arizona for a cost of at least $15 million a mile, according to testimony in previous congressional hearings. Sen. Joe Lieberman, chairman of the Senate's Homeland Security and Governmental Affairs Committee said the SBInet concept was unrealistic from the start. Napolitano's decision "ends a long-troubled program that spent far too much of the taxpayers' money for the results it delivered," said Lieberman, I-Conn. The high-tech fence was developed as part of a Bush administration response to a demand for tighter border security that arose amid a heated immigration debate in Congress. The Bush administration awarded Boeing a three-year, $67 million contract. Then-Homeland Security Secretary Michael Chertoff said at the time the department was "looking to build a 21st century virtual fence." But the fence had a long list of glitches and delays. Its radar system had trouble distinguishing between vegetation and people in windy weather, cameras moved too slowly and satellite communications also were slow. Although some of the concept is in use in two sections of Arizona, the security came at too high a cost. Mississippi Rep. Bennie Thompson, top Democrat of the House Homeland Security Committee, said the committee held 11 congressional hearings on the fence project and commissioned five reports by the Government Accountability Office, which blasted the project. Thompson, who chaired the committee until Republicans took over the House this month, called the project a grave and expensive disappointment. Last January, Napolitano suspended spending on the project beyond work on two phases of the fence in Arizona. She ordered a study to determine whether SBInet could be fixed so it worked effectively and fulfilled its original goal. She also asked for a study to come up with lower cost, equally effective alternatives. She used $50 million meant for the fence to buy other technology and Border Patrol vehicles. Boeing was the contractor for SBInet. Despite the problems, the Homeland Security Department granted Boeing a second one-year option on a three-year contract to work with the department for maintenance and upkeep of the two Arizona sections that are operational. That agreement continues through September 2011. Some technologies from the project, such as stationary radar and infrared and optical sensor towers, will be used in future border security that will largely rely on mobile surveillance systems, unmanned aerial vehicles, thermal imaging devices and tower-based remote video surveillance systems. 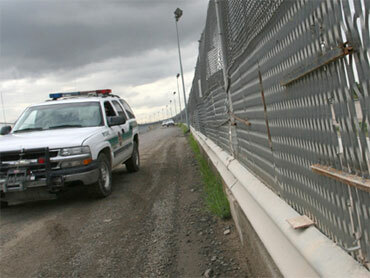 Money that was provided in an interim spending bill for the high-tech fence will go to the proven technologies. The agency said in a report that it does not intend to use the existing Boeing contract to buy other technology systems for future southwest border security. It also said it will conduct "full and open competition" for elements in the new border security plan. The Homeland Security Department has been studying other areas of the southern border to decide what technology and other resources would best beef up security in those areas. An initial proposal of technology needed to monitor three sectors  El Paso, which includes New Mexico; San Diego and the Rio Grande Valley of Texas  was to be done by this month. Proposals for border security technology for other sectors should be available by March, according to the report. Rep. Peter King, chairman of the House Homeland Security Committee, criticized the administration for taking too long to make its final decision to cancel SBInet and too long to decide what to do next. He wants a comprehensive border security plan that provides staffing, fencing and technology. In a statement, Boeing said it is proud of the accomplishments of its team and the "unprecedented capabilities" delivered in the last year to assist the Border Patrol. The company said it appreciates that Homeland Security Department recognizes the value of the fixed towers Boeing built as part of SBInet.